One of the main aims of our trip to USA in October was to cross the country from New York to Los Angeles by train. That takes a few days, so we split our journey up into manageable chunks. The first section of this amazing train journey was on the AMTRAK “Lake Shore Limited” from New York to Chicago, an overnight journey. 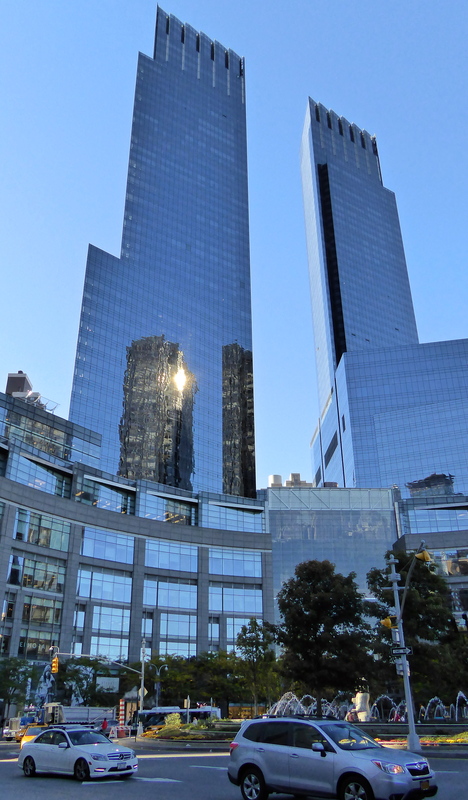 A few memories stayed with us as we prepaared to leave New York and one of those was a very pleasant lunch at the Times Warner Centre (above). One very wet morning, we had intended to visit the Museum of Natural Science…. but a few thousand other people had the same rainy day program in mind. So we took the much easier option to have a simple but delicious lunch in one of the quieter restaurants in New York. Amazingly, we could actually chat without the need to shout at each other. 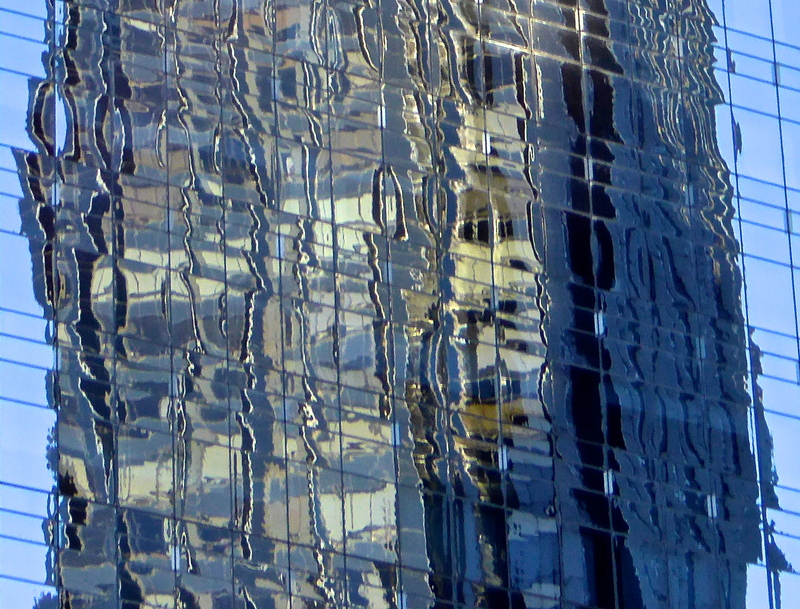 After lunch, when the sun came out, we enjoyed the abstract reflections in the glass of this tall, modern building. The varied architecture of New York is one of the fascinating aspects of this city. But, after more than a week exploring the Big Apple, it was time to board our big, double decker AMTRAK train bound for Chicago. For the first hour or so of the journey, the tracks run alongside the Hudson River. The trees were just on the turn and gave a hint of the autumnal colour to come. Being an overnight journey, we opted for a small room with beds. And small was the operative word! To begin the journey, we each had an armchair from which to watch the world go by. 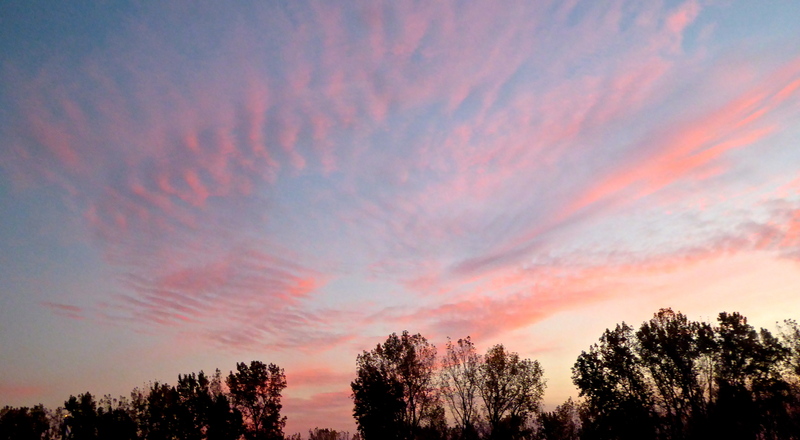 As the sun set, and the whispy clouds began to turn to salmon pink, we were called to go to the dining room. Dinner was an acceptable if not exciting repast. Conversation was pleasant with strangers we knew would never see again. Interestingly, as Aussies, we seemed to be the ‘exotics’ on the train and we were able to add to our dinner companions’ knowledge of our country… and dispell some rather unusual myths and beliefs as well! Rocking our way back to our room, we hoped that the attendant had made up our beds whilst we were away. Not so! David did an heroic effort of working out the mechanisms for changing chairs into beds and then wrestling with sheets and blankets in such a confined space. I opted for the lower bunk, of course, giving David no option but to have to climb the ladder into the top bunk. The only place for the ladder was over the top of the ‘loo’ which was right beside my bunk. In fact, one of the best ways to meet your neighbours on the train was to have a chat out in the corridor while your partner used the ‘loo’. The room was small but we were able to sleep as the train clickety clacked its way on towards Chicago. The only times I woke were when the train was stationary on a siding waiting for a goods train to pass us by. Goods trains have the right of way always on these tracks and, as the hours rolled by, we became ever later on our schedule. Next morning, we woke to a very different world; a world of quintessential American farms. and the ubiquitous red barns on each farm. This is dry country. The wide arcs of watering systems were much in evidence. Here, most of the trees had already lost their leaves. Winter was on the way. Terry commented that “this is what happens when work disappears and dreams die. A once-bustling American city turns into Gary. A model of industrial might for much of the 20th century, sometimes called “the Magic City” by early boosters, Gary today is anything but. Over the past four decades, the jobs and the people have been chased away as Gary’s biggest employers had to grapple with low-cost foreign competition and responded by installing technology that enables two steelworkers to turn out as much steel as a dozen did a quarter-century ago. 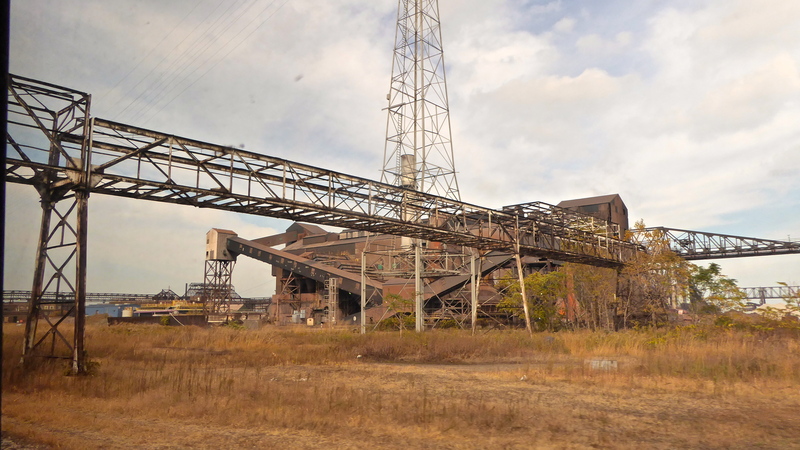 The five steel mills of Northwest Indiana—including the largest, the U.S. Steel mill in Gary—used to have a combined workforce of up to 100,000. 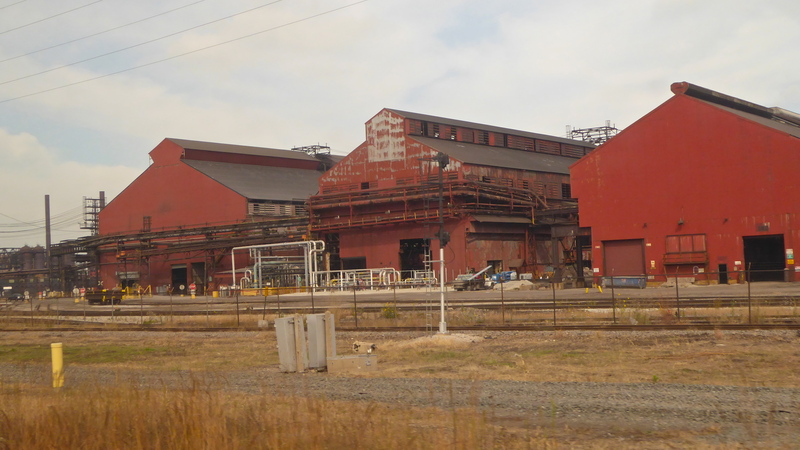 They now (in 2012) employ roughly 20,000 people and are producing as much steel as ever.” The old less productive mills are now silent. We had plenty of time to take in this area as we waited for yet more goods trains to pass us by. We wondered what nearby Chicago had in store for us. We were in for a very pleasant surprise; Chicago is one city I would recommend anyone to visit. I would like to return one day. 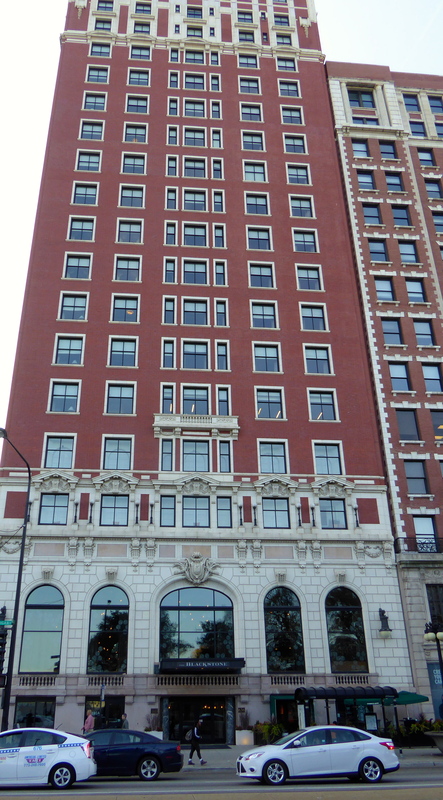 Our Chicago hotel, the Renaissance Blackstone Hotel, was an older building; they call it “Classical Revival Beaux-Arts” architecture. Whatever the style name, this hotel, in times past, has hosted Presidents, Politicians, Film and Sports stars…. and now it hosted us! 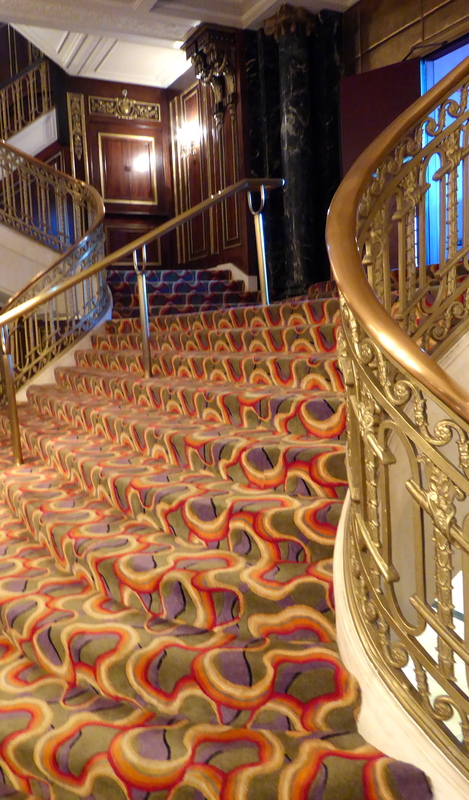 Although the rooms have been updated to include many modern amenities, there are still reminders of the grand old past in the public rooms. 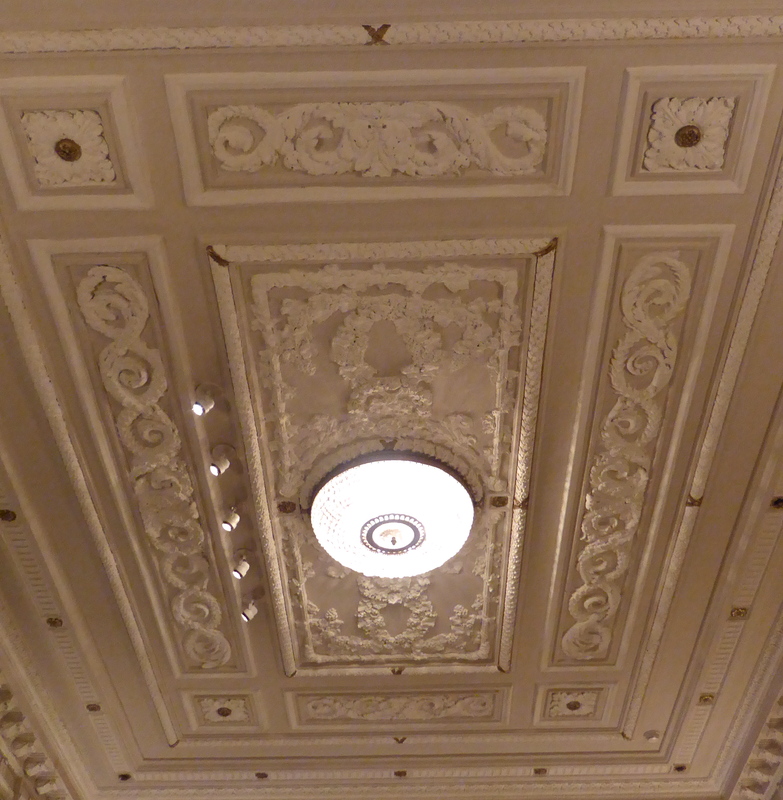 The public room ceilings are elegantly decorated. 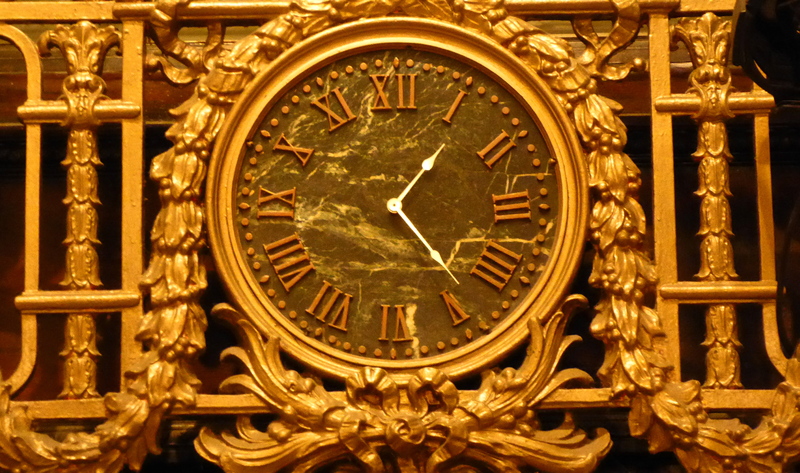 The beautiful old wall clock gave us the hint that it was time to get outside and see something of this city. With advice from the friendly reception girls and a map in hand, we set off to explore. 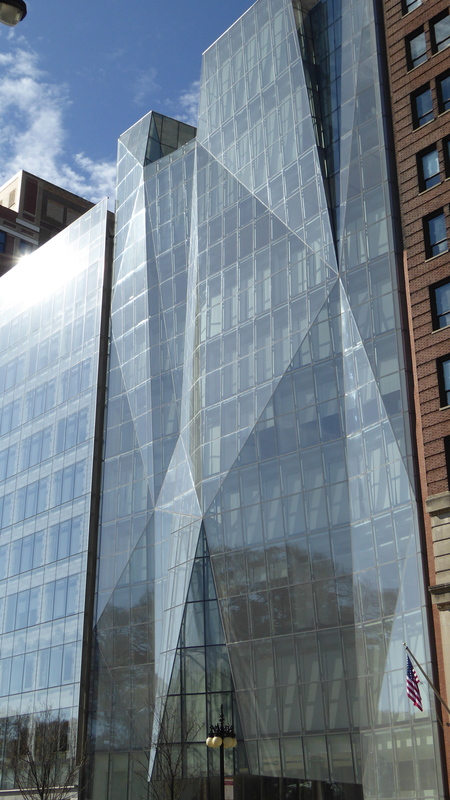 By contrast to our hotel, this building almost next door, is an ultra modern glass construction. This is the Spertus Institute of Jewish Learning and Leadership. The contrast between these two buildings was the beginning of our fascination with the architecture of this city. 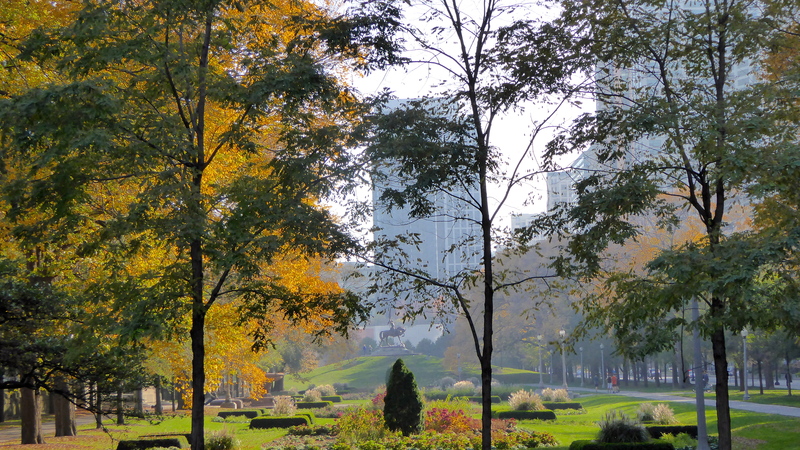 But, our interest for the afternoon was the long park that runs the full length of our street, South Michigan. This park is a corridor of green between the busy street and the railway lines. Beyond the railway is another extensive park along the banks of Lake Michigan. This was a great place to explore. 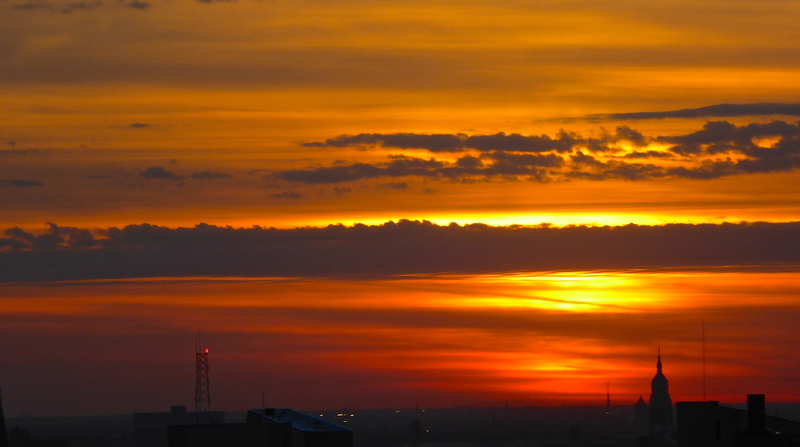 After a few hours of walking and enjoying especially the Millenium Park in Chicago, we made our way back to our hotel in time to see a glorious sunset from our room. We looked forward to a good night’s sleep in a much larger room, in a much more comfortable bed, with no clickety clacking and rocking of the train. That would come again the next night, and the story of that part of our journey will be the topic of my next post.